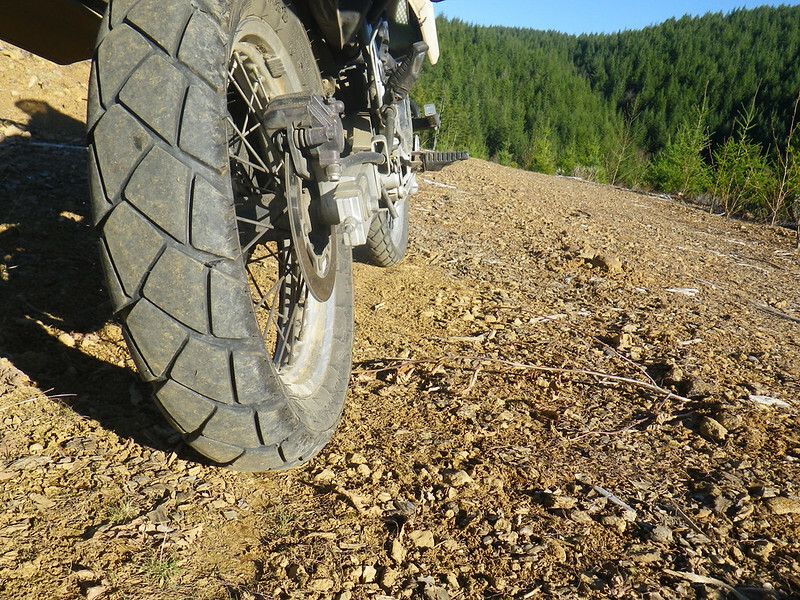 The KLR is currently wearing its way through the second set of Metzeler Tourance Dualsport Tires. They're rated as an 85% street, 15% off road tire. Previously I'd gone through a couple sets of stock tires (my point of comparison) which, for those who don't know, are a far knobbier tire. Throw a couple of "L's" on there if you're British: Knobblier? Anyway I must say these tires have done me good over the years in a wide variety of conditions so I thought I'd do a little review. In researching these tires I've found a lot of folks go between these and Avon Gripsters. There's no doubt the Gripsters get great reviews from KLR riders and will certainly save you a bundle of money (Gripsters usually come in at $200 for the set compared to $300-350 for the Metzelers). But again I haven't spent a ton of time on a variety of tires so I'll get down to what I like about the Metzelers. A lot of time was spent looking at both the Tourance and the Enduro 3 (a 50/50 tire also made by Metzeler). I had just worn down a set of Tourance tires and was on the fence about whether I missed my knobbies of not. Ultimately I had to be realistic with myself about my riding needs. My passion for riding off-road is great, but this is a bike I ride everywhere. Cross-town commuting trips, weekend rides to the coast or Seattle... And few of my friends have the bike or desire to ride off-road themselves. So the reality of how much time this bike would be getting dirty vs not settled my mind on going with the Tourance: I WANT to ride off-road all the time, but my lifestyle doesn't permit it. Plus I live in Portland, which means there's still inevitible highway riding before I can hit quality dirt. So with the decision made it was time to go shopping. After a tip from a friend I waited until a "Free Shipping" deal came along and purchased my set from Chaparral Motorsports to save some cash. Don't get me wrong, I prefer to support small business over dotcoms, but I'm also cheap so I take what I can. Plus I was replacing the previously worn out set of Metzelers so I already knew what I was getting into. I had the guys at Vicious Cycles do the mounting for me (See? Supporting local business). The price was right, and by delivering the wheels off the bike the turnaround time was just hours, even when they seemed really busy (Call ahead just in case). They have some very impressive bikes to take a peek at while you're there which is always good reason to give a shop a thumbs up. Typically I run these tires at 34 psi. It makes for a solid contact patch in dry conditions and does really well in the wet (believe me: there's no shortage of that in these parts). It's a solid and predictable tire from edge to edge. A tire that I've had over far enough to scrape pegs on more than one occasion, but one that provides a smooth ride when the bike isn't carving hard. For off-road riding I'll typically drop the pressure down to around 28 psi or so and the grip dramatically improves. I've ridden in loose wet gravel at 34 psi, but dropping them down definitely improves the overall ride comfort and peace of mind. Obviously a quality side knob is missing from the tread patterns in the above pictures so it's not the tire you can simply kick your hips out, bury the side tread, and rail a dirt corner on (oh how I miss that) but once you get used to a certain amount of controlled sliding I feel it's plenty stable at a respectable speed through the looser terrain. There are few places I've been where I felt I was going to get in trouble with the Tourance. My last set of Tourance tires lasted around 10k miles. Some folks online are claiming 5k more, and some about 2k less. These numbers are obviously going to vary depending on whether your state chip-seals the roads, gets hella hot in the summer time, if you turn ever, and if you're carrying a camper-van around with you on the back of your bike. But these things are just common sense, right? 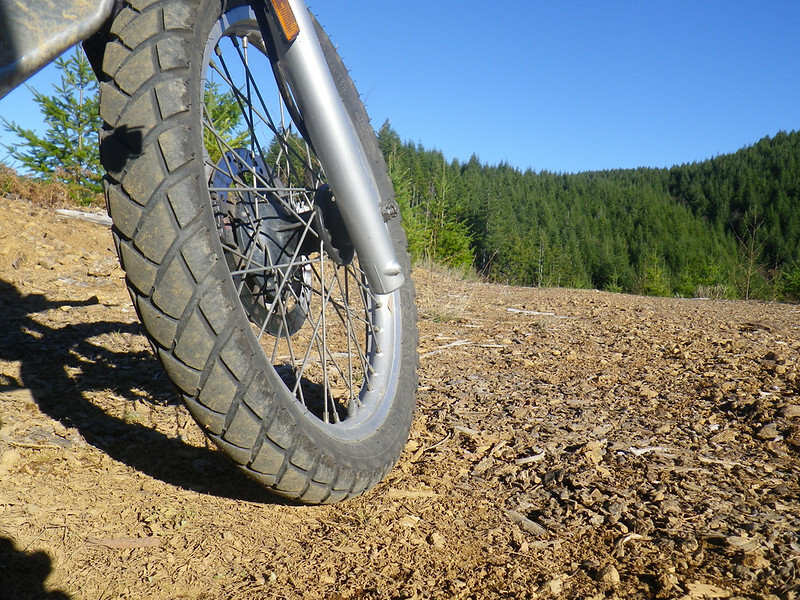 Years ago I rode the stock KLR knobby tires and on a long one-day push from Port Angeles, WA to Boise, Idaho I would swear you could visibly see the center tread on the tire wearing away. But a softer knobby tire on a hot summer day spent on freeways is gonna do that. The Tourance also performs well regarding puncture resistance too. I've been fully loaded and ridden through more than a few patches of sharp crushed shale in Idaho without any flats. The only puncture these tires have had was a 3" decking screw up in Seattle a few years ago, and what're you going to do to prevent that anyway? My ride last weekend took me through asphault, hardpack, loose gravel, soft sand, mud, and a few frozen corners. 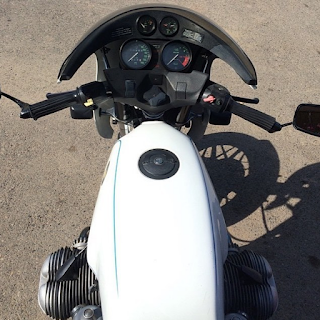 All in all it was about a 200 mile ride, half of which was off road, and I felt very confident with the tire at 30 psi and a medium weight load on the back of the bike. It did everything a proper dualsport tire should. As you might expect there was a couple patches of mud and gravel that made me wish I had a bit more tread but not to where I lost control or got stuck. I would more realistically rate these tires as a 75/25 split, and think their ride quality makes them well worth the investment for KLR riders. 1. With my BMW project nearly on the road I'll likely be picking up the Enduro 3's once these tires wear out as the KLR will be more of a dedicated dualsport bike. I'll let you know how those work out when I get them (AKA: how often I get stuck because I think knobbies can take me anywhere). 2. My dad tried to run the Metzeler Tourance on his 94 BMW GSPD and encountered massive handling issues. After double checking to make sure the tires had been mounted correctly he just opted to switch to the Avon Gripsters and ditched the Tourances. I can't offer much more than the anecdote, but I feel it's an experience worth sharing. I've never had these issues with the Tourance tires on the KLR. One of the nicest reviews I've read so far. 😃 Thanks for it, ordered a pair for my serow xt225we. And like you I'd be riding it more on the road ad a little off-road (I prefer har pack though).